I have been always obsessed with Bhutan, ‘the land of thunder dragons’, ever since I have known about this place. There is something spellbinding about it. Perhaps, the warmth of its intriguing culture, the colourful prayer flags, beautifully embellished monasteries, mystical rocky mountains, or maybe its mere simplicity. A quintessential holiday in Bhutan was always on the cards, but I was waiting for the right time, or should I say the wrong time. The usual work routine for months at a stretch without a holiday can wreak a serious havoc on your mental health. I realised the same when I suffered from depression. After suffering from usual symptoms for a long time, I decided to go on a spiritual trip. And the first place that struck my mind was Bhutan. The mere idea of travelling to “the land of happiness” gave me a hope and instilled my soul with vigour. Needless to say, this spiritual getaway has left an indelible mark on my mind. So, I finally embarked on a backpacking trip to Bhutan from Mumbai. I did this trip with my sister and called it “Sisters on Adventure”. Flight – Mumbai to Bagdogra – Rs. 8000 approx. From Bagdogra to Phuensholing (India and Bhutan border) – 3 and half hour by road – Rs. 2500 approx. From Phuensholing took a local cab for the rest of the trip. You can bargain cab costs at the border and get really cheap deals, depending on the number of days. I paid Rs. 12000 for five days and it was all worth it. The moment the wheels of our cab started rolling on the wide and winding roads of Bhutan, I realised that I had ventured into a different world altogether. I was enthralled to see this new place unveiling itself slowly, as we kept rolling up the mountains. The lush green vegetation and huge rocky mountains swathed with mist and clouds are simply breathtaking. You can’t take your eyes off such a creation of nature. Just a peripheral view was enough to lift my spirits and broaden the smile on my face. This four and a half hour journey ended at our hotel, situated at the centre of Thimphu town. The city is beautifully organised, and it is the only capital city in the world with no traffic lights. Can you image a city with streamlined traffic without traffic lights? Come see for yourself in Thimphu. We started our adventure in Thimphu the next morning with Chorten Memorial, a prominent landmark in the city famous for its huge golden spires and bells. I recommend heavy breakfast as rolling those spires will take your half a day energy. After this, the usual sightseeing started and it included the Big Buddha Statue, the Kings Palace, Choki Traditional Art School, Zorig Chusum Art School, Folk Heritage Museum, and Changangkha Lhakhang Monastery. 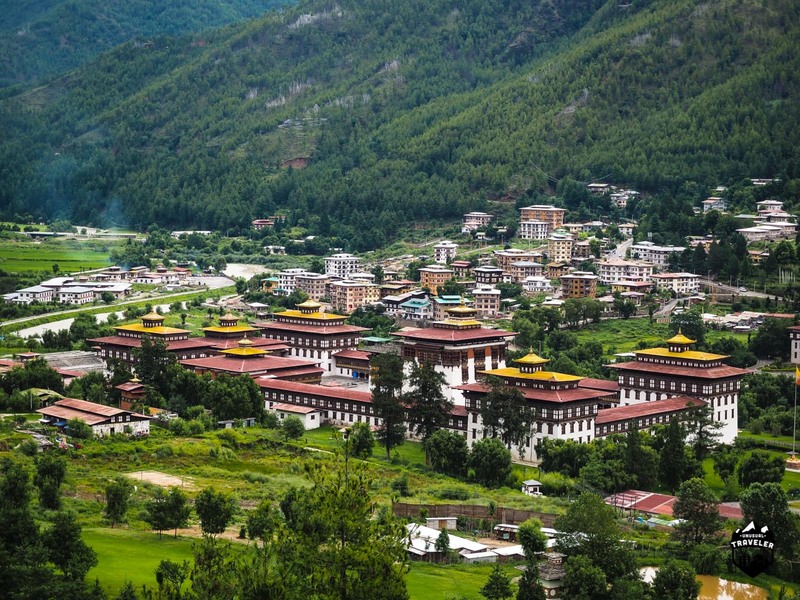 Each attraction in Thimphu is surrounded by a beautiful natural setting. The bird-eye view of Thimphu town from the Big Buddha is mesmerising. One of the most beautiful things about Bhutan is that it not a typical tourist destination. You can enjoy your ‘me time’ and space around each attraction to absorb the vibe of the place. Another new discovery was outdoor gyms located every 15 to 20 minutes in the town. Open to everyone, you can exercise anytime and anywhere. • Visit the famous Swiss Bakery for the love of scrumptious Swiss rolls, cream rolls and coffee. • Like reading? Visit the coolest book cafes in the town – Ambient Café and Café Junction. You will find the young hip crowds, chitchatting and high fiving. • Explore the town on foot and visit fancy clothing and souvenir shops to acquaint yourself with the local culture and lifestyle. Paro is much more beautiful than what I had heard and seen in the pictures. The next morning we left Thimphu at 9 and reached Paro at 11. It’s a 30 to 45 minutes journey, but we took a halt in between to sit by the bank of crystal clear Paro River. The shallow waters of the river shimmer when kissed by sun rays. After this, we were lucky enough to spot a plane taking off from the world’s shortest runway at Paro airport. After lunch, we left the Paro city for Chelela Pass – another road trip full of adventure and scenic views. As we were driving up the steep mountain, there was an unexpected rendezvous with snow sitting on the sides of the road and some portions of the mountains. I was, at that time, the happiest person on the planet. 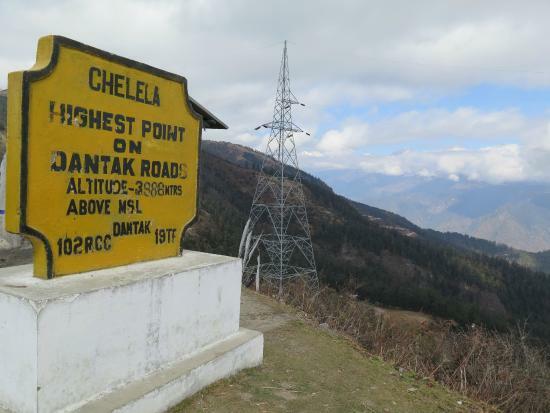 After a few halts for selfie sessions and going bonkers among snow-clad mountains, we made it to Chelela Pass, the highest point on the Dantak road. It’s a perfect place to take in the breathtaking views of Jholmari peak, Paro Valley and Haa Valley. Do not miss out on the short trek which leads to an open ground at the top of the pass. The views are even more beautiful and clearer from this point. The tranquillity of this place had sent me into a peaceful state of meditation for some time. You will thank me zillions for recommending you this. We ended our day with a walk around the city featuring a plethora of souvenir shops and a couple of cosy cafes. The next day was saved for the divine Tiger’s Nest trek. It’s a must-do when in Bhutan. It’s around 3 to 4 hours trek with medium level difficulty. You will meet and greet a lot of people passing by, especially foreigners. The Taktsang Monastery uncannily sits on the vertical rocky mountain, making it the most photographed location of Bhutan. It’s exceptionally beautiful from the outside and extremely peaceful from the inside. And the panoramic view of the Paro Valley from the top is more than just refreshing. You can meditate inside the monastery if you wish to. Don’t forget to buy local souvenir once you hit the base in the afternoon. It is one of the cheapest places to buy local stuff, and be ready for a lot of bargain too. We indulged in a soothing full body spa after souvenir shopping so that we could at least walk the next day. The next morning we left our resort with luggage for Phuensholing. On the way, we visited one of the most beautiful dzongs in Bhutan – Paro Dzong. It’s considered as the high point of Bhutanese architecture. Nestled on a steep hillside, the dzong features an impressive façade and picturesque garden. Below the dzong, a traditional wooden covered bridge spans the Paro River. As we bid adieu to the beautiful Paro town and embarked on our way to Phuensholing, we caught a glimpse of some of the most picturesque views of Paro River, flowing deep down the narrow gorges. Those glimpses got imprinted in my memory permanently. 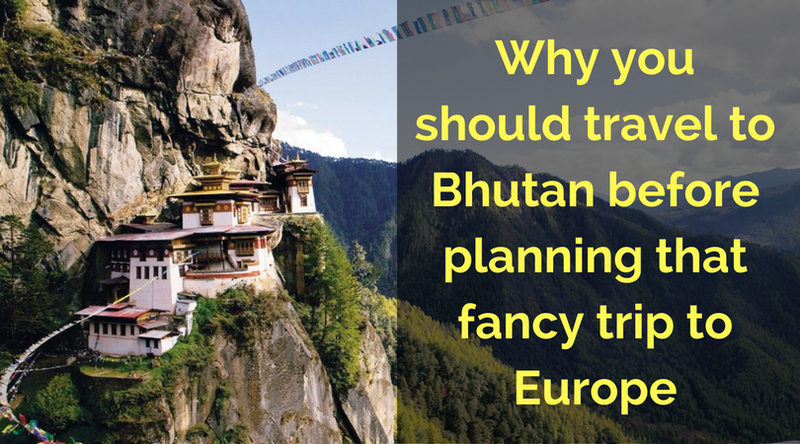 I urge youngsters, backpackers, travellers and holidayers or vacationers that before you think of planning an expensive holiday to Europe or America, make Bhutan your summer getaway this time around. It’s closer to India, extremely beautiful and a totally unique place to escape into. 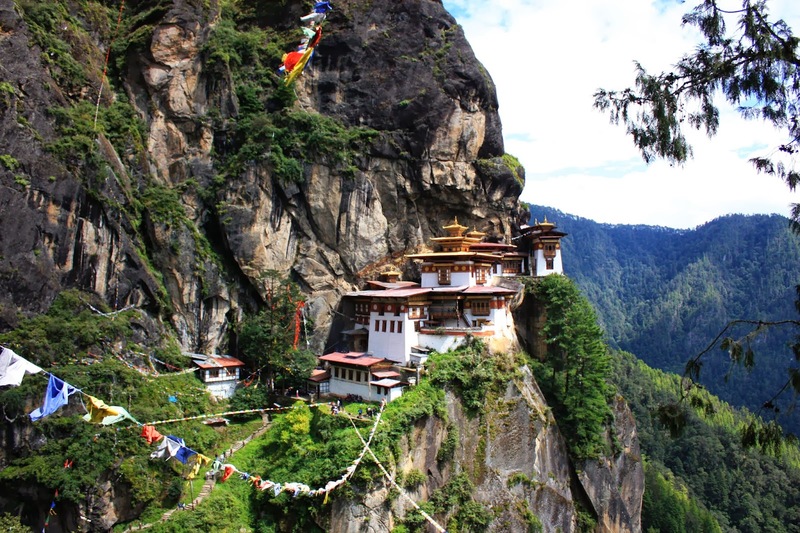 Inspired to go to Bhutan? Awesome! Use MyTripKarma to plan your trip – It’s a one-stop-solution to all your travel needs, allowing you and your friends to collectively plan, discuss, budget and book all your trips with the best prices from around the world! Ratna Sehgal is an ardent reader, who loves weaving magic with her words. She is a content specialist and strives to be a digital marketing evangelist. Sci-fi gives her escapism and food brings her back to life, which she thinks is a beautiful roller coaster ride. Apart from her work, she aspires to be a nomad and touch people’s life with her experiences.